We spend a fair amount of time using our computers for planning our travels and are always on the lookout for tools that will help the process. 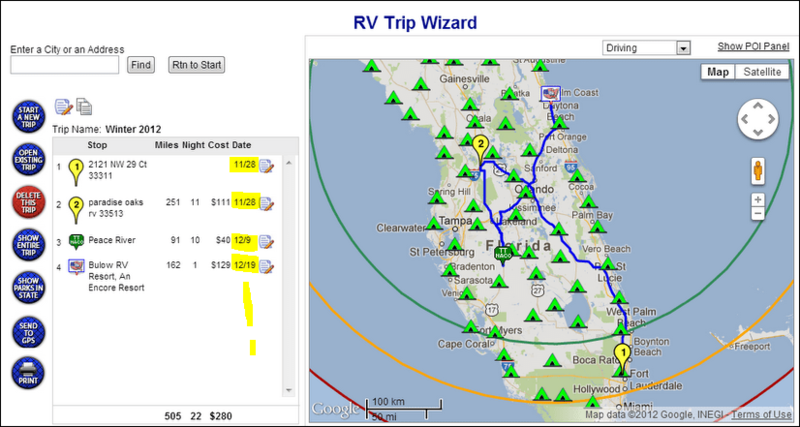 The latest one that has caught our attention is RVTripWizard.com. It is completely web-based. There is nothing to download to your computer. You must have an Internet connection, and then you can use any device with a web-browser. I’ve tried it on our Nexus 7 tablet and on our iPad. It works, but it’s a lot easier on the computer, just like most websites. Notice, in the image below, that the maps come from Google Maps, so we already know how to navigate around that part of the screen. It even includes the Street View ‘Peg Man.’ Also notice the yellow highlighting I added to the left side of the screenshot. That area contains the details on each stop along the way – what has me so excited is that the stop list includes the date that you will arrive. This is not a feature that everyone cares about, but we sure do. Our travels revolve around being at rallies on specific dates and we have yet to find any other trip planning software that includes this logical information! You can create, and save, as many trips as you like. They will stay online as part of your account for as long as you have an account. This makes it easy to look up a past trip and see where you stayed. You can even write notes about the campground, the site, the local area – whatever you want. In addition to the dates (our favorite feature!) the program calculates miles and costs for each segment based on your settings. You can also manually enter costs, so this can be an accurate report of your expenditures for any given trip. Printing: It’s so nice to have an overview of your trip to pin to a bulletin board, or tape to the refrigerator. RV Trip Wizard prints out a nice map and listing of all your stops with the miles, number of nights, and DATES! It does not include turn by turn directions. That’s fine by me – I just want the one page overview. We’ll still be using GPS Navigation to get there. Saving: the system saves your work after each thing you do. There is no need to save – it’s already done. Which is a good thing because if you leave the RV Trip Wizard screen idle for a while, it times out and goes back to a blank map. No problem, just open your existing – saved- trip. GPS – this is not a GPS navigation program. It is a trip planning program. That’s OK, it’s a really nice planning tool and we have plenty of other navigation tools. My request is that it integrate completely with Google Maps. I’d like to see this same set of marked points on My Maps in Google. So, let me enter my Google account username and password and find a way to take the marked stops from RV Trip Wizard and save them as a map in My places. That would be AWESOME – since My Maps is also on my Android smartphone and tablet. See last month’s article: Google Maps from the Web to your Smartphone. RV Trip Wizard has a form for suggestions – I think I’ll fill it out with that one! They do have a ‘Send to GPS’ button where you can download a .csv file of all your stops and import that into Garmin devices using the POI Loader. Saving to your computer – I’m not sure if there is a way to do this but I don’t see any. This is strictly web-based, I see no way to archive your trips to your computer for any kind of future reference. I assume whenever you cancel your membership, then your trips will disappear. March, 2014 update: I now see there is a feature for “Print to Excel.” This solves my issue perfectly. The resulting Excel file keeps all my trip data, destination, arrival date, departure, travel miles, cost, and latitude/longitude of the planned stops. We’ll keep putting RV Trip Wizard thru it’s paces and get back to you in a couple months with what we’ve learned. RV Trip Wizard costs $37/year. They give you a 2 week Free Trial before any fees are charged. For more info see the RVTripWizard users Guide. If you try it, let us know what you think in the comments below. Published by MrsGeek, in Blog. Tagged with RV Trip Wizard, rvtripwizard.com, Travel Planning, Trip Planning. Saving to your computer: Yes, you are right. All trip data is saved to our server. We do not save anything to a local computer which means nothing ever needs updating. This also means that trips disappear if a subscription is cancelled, meaning one cannot sign up for a free trial, plan this year’s vacation, quit, and then do it again later. It is tried. Took a further look at your request and determined that Google does not permit a file to be uploaded to a custom map. You can, however, add the trip stops by printing a trip in pdf preview and copying the address or GPS coordinates for a stop and then pasting that into the address box on your custom map. Alternatively, you could download the Garmin trip POI file and open in it either Microsoft Excel or Apple Numbers, and then get the GPS coordinates from there. By doing this in stop order, you will get your route for a given trip. We would love to show your current location as you travel a route withing RV Trip Wizard™, but that would violate the Google TOS. You’d think that after charging us $12,200 per year to use their bloody maps commercially that we could at least show you where you are! Really good suggestion and we will look into it just as soon as we get a couple of big internal tasks off the table. Today is the first I’ve seen your writeup and I’d like to tell you how much we appreciate it. RV Trip Wizard™ has been on the market for just a year now and we’ve come a long way, but there is always something new to add, and we’ll keep doing just that. Suggestions are always welcome! I totally agree with your comments about integration with Google Maps and RV Trip Wizard. Not many people use Garmin or other standalone devices for GPS navigation anymore and now use their cell phones or tablets. Google Maps integration is extremely important to me and will keep me from the $37 annual fee until this is available. The whole purpose of RV trip planning is to use your plans to get there. They have missed a very important feature that should be a high priority to include.